The Canucks just can’t seem to win a hockey game. They had four wins in all of December. They are 0-3 to start the new year. The good news is, there are injuries. The bad news is, even if everyone was healthy, this team wasn’t likely going to make the playoffs. The good news is, they have Brock Boeser, who makes any game a hundred times better, and makes the future look more exciting. The bad news is, this season contains potassium benzoate. Yes, on a night when the Canucks managed to battle back and tie a game in which they were down two goals, one might feel a bit disappointed that they ended up losing 5-2 to the Montreal Canadiens. And sure, maybe “playing the kids” turning into “play Boeser” is a bit of a stretch on the ol’ war cry, but you have to admit, it’s better watching Boeser turn into an NHL superstar, then watching Megna on the power play like last year. Last year, there was no hope. It felt very bleak. This year, there is Boeser. And yes, it feels very much like an “all your eggs in one basket” approach for hanging all of your optimism on. And yes, there is probably a large debate to be had about how different this season would feel if Travis Green was coaching a team without Brock Boeser making it literally impossible to not play him. Goldobin, Virtanen, and Boucher’s scripts haven’t changed that much from last year. Add in Hutton fighting to stay relevant over veterans Gudbranson and Del Zotto, and there is a case to be made that “young guys getting to play” isn’t happening all that much in Vancouver. But if the Canucks end the season with Boeser in the mix for the Calder, with Horvat coming back and ending the season strong, and the Canucks landing a high draft pick out of it? That’s not a bad season for the future. It’s probably a bad season for the current management’s future. But for adding some more young players to the pool? Not bad at all. Yes, it’s a story as old as time. One guy trying to prove he’s not quite as bad as the guy beside him. It’s like setting up a Tinder profile where instead of listing your positives, you list reasons why you’re better than the other guys, but it’s all set at a very low bar. One of the problems with a team that is average, is that sometimes it puts a big burden on the goalies. Not a lot of goalies are going to see a ton of odd man rushes and end up having a good day. Not everyone can be Hasek. Well, nobody can be Hasek. But not everybody can be a top five goalie who can make miracles happen every other game. That being said, it’s felt like the Canucks goalies rarely if ever bail their team out, which makes you have the sneaking suspicion they might just be mediocre goalies. And it’s tough, because it really becomes an issue of how much blame do you put on the team defence, and how much do you put on the goalie, and since the goalies are in the spotlight, they get the bulk of the blame. But it’s hard to argue that the goalies have been good enough this year. Both Markstrom and Nilsson have routinely let in very soft goals, which is something a team like Vancouver cannot afford to let happen. As for tonight, Nilsson had a solid game, despite the fact he was scored on five times. And yeah, part of it is sad that a five goal game is a good game for Nilsson, but he did have to deal with a lot of the aforementioned defensive issues. Breakaways and odd man rushes were a common theme tonight. Half the time it was because Vancouver was being a bit too aggressive on plays, and sometimes they just got beat by the faster Montreal players. Despite the strong start, Nilsson let in a goal, that although it was deflected, you really felt like he could have had it. Sure, Stecher got a stick on it, but it didn’t change the puck’s trajectory all that much. But again, here we get back to the defensive issues Nilsson had to deal with all night. Yet another breakaway that he had to turn aside. Nilsson gives up another goal later to put the team down 2-0, but that’s hard to pin on him. Sure, he could have been more square to the puck and made himself bigger in there, but Montreal got him moving, and it was hard to set up. But again, here is Gudbranson going for an ill advised pinch. Maybe with his team down 2-0 he’s trying to make something happen, but the end result is yet another breakaway. Want another turnover? Here you go. Gaunce turns over the puck and Hutton doesn’t have his guy behind him, and it’s yet another one on one situation with Nilsson. Eventually all those chances add up, and Nilsson kicks out a rebound into the slot that Dan Cloutier himself would have done back in the day, and the Canucks gritty resolve to tie the game up, is gone in smoke. And again, more high danger chances for the Canadiens. Down only one, Stecher goes for a hip check of all things, misses it, and gives up a two one one that was thankfully slowed down by Canucks Jesus Brock Boeser. 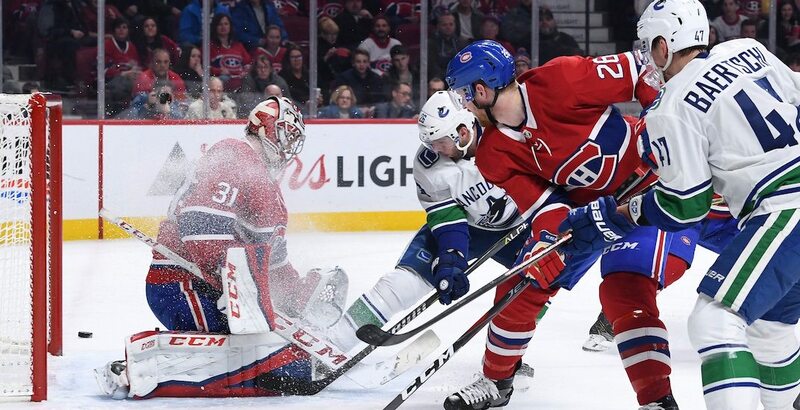 So yes, it wasn’t the greatest game of all time by Nilsson, but when you watched the game, and realize it could have been 10-2 for the Montreal Canadiens, you realize he had a pretty damn solid game all things considered. Nic Dowd is in that sweet spot of playing well for a bottom six winger, but also earning the love and trust of the coach, so he gets a lot of minutes. Enough minutes that fans are going to be debating how much he should be played. Like, “We like Dowd, but should he be on the ice in overtime?” sort of debates. That being said, he did have a very rough start to his tenure in Vancouver, but has since settled in nicely. Tonight he played with a lot of confidence, and was making much smarter passes, and was also very good at playing his role of “grindy annoying guy who checks people all the time” very well. That guy you hate in beer league because he’s taking it way too seriously. He also ended the night with 15:32 of ice time, which yeah, means Coach Green likes him some Dowd. When Horvat comes back, and Dowd drops down to the fourth line, it will be interesting to see his deployment. Until then, though, Dowd has done a good job of learning to play the Canucks system, and deserves some kudos thrown his way. Dowd, by the way, finished third on the team in Corsi on the night. He also got called for a garbage penalty due to the fact NHL sticks break like balsa wood. Yes, Baertschi returned, but it was hard to imagine him being terribly effective, what with him wearing a cage and still trying to ease into playing after having his jaw broken. He’d be forgiven if he wasn’t going all out in his puck battles due to his injury. Baertschi with the Sedins was not nearly as effective or interesting to watch as Goldobin with the Sedins, but it’s understandable that you want to bring in your top six winger back into action in a scoring role. It would be nice if Goldobin could still be in the lineup, but Coach Green doesn’t appear to be ready for that yet. So when Bae struggled with the Twins, Coach Green did something he is very comfortable with, which is applying the Boest solution to a line that needs help. Right away it paid dividends, with Boeser almost scoring on a nice re-direct from a Daniel pass. Things really paid off when Boeser set up shop in front of Price, putting up a great screen that Daniel Sedin was able to use to tip home an Edler shot. How good is Brock Boeser? So good that he makes any line he’s on automatically the best line on the team. God knows there’s been enough hyperbole about Boeser’s season in Vancouver, but it honestly doesn’t feel like enough at times. Boeser ended up 2nd on the team in Corsi. His old line of Vanek and Gagner, who went on to play with Baertschi? Ended up dead last in Corsi. Again, you don’t want to be too hard on Baertschi not being great in his first game back, but it does highlight the power of Boeser that he can move between lines and not only continue to play well himself, but make others around him better as well. You know you’re good when you get two points for yourself in the SixPack. Yes, Boeser set up Del Zotto nicely, to tie the game up at two. Full credit to Del Zotto for the nifty move I always try in hockey but fail miserably at. Del Zotto, who has not been great in his own zone, really needs to produce offensively to showcase why he should be an every day top four d-man for this team. So making smart pinches like these are what he needs more of. Or, to summarize, find a way to play only when Brock Boeser is on the ice. Jake Virtanen continues to play well enough that you are just dying to see more ice time for the kid. It truly feels like Coach Willie is coaching him from beyond the NHL grave, making sure Jake never gets too ahead of himself. I’ve said it before, Travis Green gets a lot of leash since it’s his first year here. So if the man has a plan, let him play it out. Sure, Coach Willie was given the same leash and ended up choking on it, so the fear that Green could do the same thing is a legit reason to be concerned. But that’s the give and take of the NHL, trying to allow patience in a game where it’s oh so very hard to keep. That being said, take away all the coaching aspect of it all, and it is frustrating to not being able to know what the Canucks have in Jake. To see him have good underlying numbers, to see him be one of the better guys on the team at gaining the zone, and knowing he has that good shot, and not ever really seeing him get unleashed on a game. Jake almost got Eriksson a point! That has to be worth something, right? When you realize you have the sickest flow in hockey, even with a helmet on.